Dravida Munnetra Kazagham president M Karunanidhi on Monday alleged that his party was ‘insulted’ at the swearing-in ceremony of J Jayalalithaa as Tamil Nadu Chief Minister, complaining about the seating arrangement made for his son M K Stalin. He said Stalin was made to sit ‘among the crowd’ even as a losing candidate and All India Anna Dravida Munnetra Kazhagam ally, R Sarath Kumar, was allotted seat in the front row. 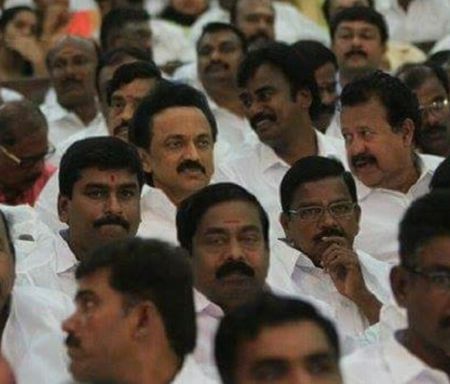 “Stalin, who has the qualification to sit in the Main Opposition (possibly as its Leader) after DMK won 89 seats, was given seat among the crowd whereas Sarath Kumar was seated in the front row,” Karunanidhi said in a statement. DMK was “insulted” in a planned manner, Karunanidhi said and criticised Jayalalithaa over the incident. Stalin, attired in a white shirt and dhoti, was spotted seated in the 16th row at the Madras University Centenary Auditorium, the venue of the swearing-in function, breaking a practice of the rivals keeping away from the other’s ceremony. Former DMK Ministers E V Velu and Ponmudy besides their party MLAs Sekhar Babu, Vagai Chandrasekhar and Ku Ka Selvam were also seated near him.